The Book and Record Bar has rather a refurbished, unsullied look about it, having been opened in 2013, but is run by a seasoned proprietor, Michael Johnson, who knows his vinyl. The shop also sells secondhand books, coffee, and features live music and soul nights. Among those who have DJed there are local luminaries such as Dr Alex Paterson of The Orb and Jono Podmore of Metamono, while the shop also plays host to the WNBC radio station. A vital south London hotpoint in the vinyl revival. Digital streaming may be the future for music lovers but good old vinyl records are still proving an enduring attraction.Vinyl collector and enthusiast, Michael Johnson, opened The Book and Record Bar, a second-hand record and book shop two years ago, and says interest in vinyl records is booming. Further on the trail of South London vinyl, we visited a popular shop in West Norwood – Michael Johnson’s Book and Record Bar. Michael is another music enthusiast and sometime 90s House DJ, who has taken his passion for music and built it into a business. The shop has been going for around two years now and is increasingly successful as the vinyl revival has taken hold. Michael stocks a wide range of music genres, from Jazz and Blues through Rock, Soul, Electronic and House. Also at the Book and Record Bar is the monthly Soul Night and Thursday radio show on WNBC (West Norwood Broadcasting Company). Oh, and he sells Volcano coffee too! In the last decade, record shops and to a lesser extent book shops have been experiencing a very visible decline. The old high streets, previously littered with high street retail giants like Virgin Megastore or Tower Records and supported by a handful of quirky independents are now a sorry sight for music fans, but it looks like there is at least still hope. 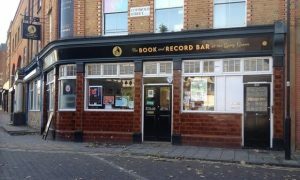 The Book & Record Bar is opening on Saturday 31st August at 10am. West Norwood’s newest coffee shop will be selling second hand fiction books and vinyl records along side the coffee!